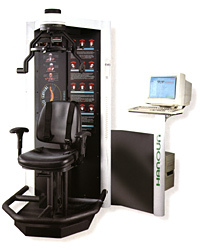 The Hanoun Multi-Cervical Unit (MCU) is the most comprehensive cervical spine (neck) evaluation and rehabilitation system available in the world. The Multi-Cervical is a digitally interfaced system that allows for the real-time recording of cervical spine movement and isometric strength in more than 1,000 unique positions. The system also features a dynamic strengthening program for cervical spine (neck) conditions. The Hanoun is for the treatment of conditions such as chronic neck pain, whiplash, headaches, herniated cervical disc, bulging cervical disc and arm pain (radiculopathy), numbness and tingling. The Multi-Cervical unit enables the doctor to evaluate and restore strength and function of the cervical spine and neck musculature. The system has been used with remarkable success and has been featured on television news programs across the United States, Canada, and Australia. The patient population includes individuals seeking treatment for whiplash injuries from motor vehicle accidents, headaches, chronic neck pain and upper extremity related conditions involving cervical disc herniation (i.e. numbness, tingling and weakness). According to published literature, over 75% of the patients treated on the Hanound Multi-Cervical unit have responded positively and demonstrated progress toward full recovery from their neck pain. Treatment sessions generally range from 15 to 45 minutes in duration. Treatment frequency is usually 2-3 times per week for a period of 6 weeks. The treatment program is based upon the severity of the injury and progress in treatment. If you have been dealing with chronic neck pain or have experienced whiplash and can't find the right solution, call Sonoran Spine & Rehab in Phoenix, AZ to inquire about the Hanoun Multi-Cervical strengthening program.